Using DYMO Address Fixer, you can check an address that you have added to your label against a database of US addresses, correct any mistakes, and automatically add the complete nine-digit ZIP+4 code. 1. Enter an address into an Address object on your label. 2. Click on the magnifying glass icon in the toolbar. The corrected address with the ZIP+4 code is displayed on the label in the Edit area. Select the label type that you want to use, and then select the blank layout. 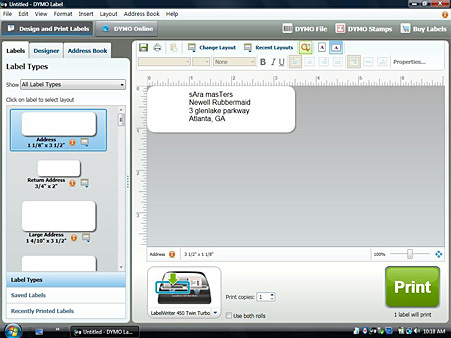 Add any object that you want to your label such as clip art or a shape. Modify the object as necessary. Using this software, you can quickly print mailing labels from a number of standard database formats including Microsoft® Access, Microsoft Excel®, text files, and Universal Data Links. 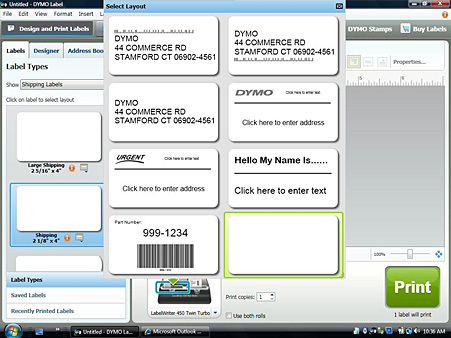 Database information can be inserted into a variable text, address, or barcode object. If you have more than one address, text, or barcode object on your label, you can select the fields to insert in each of the available objects. Select the label type and layout you want to use. 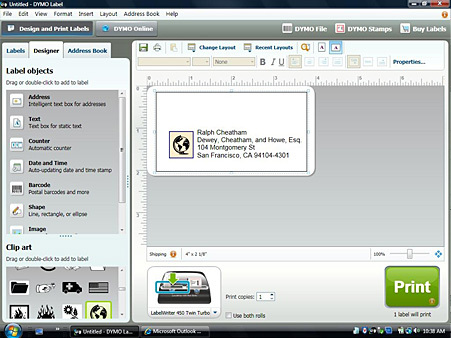 Make sure that your label layout includes at least one text, address, or barcode object. 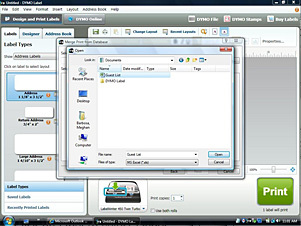 Choose Merge Print from Database from the File menu. 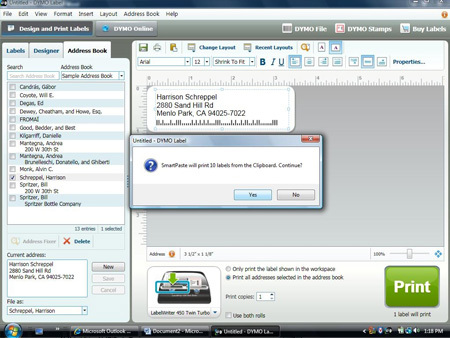 Follow the instructions in the wizard to choose your data source and print your labels. 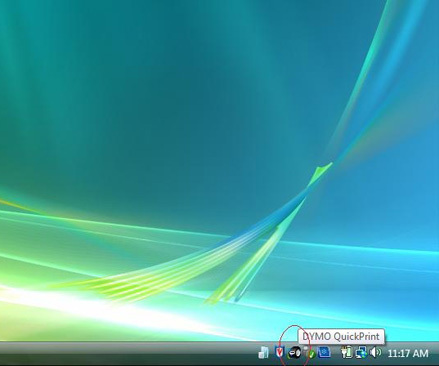 The software now includes a QuickPrint feature that is located in the notification area of your desktop. Now you can drag or paste addresses from any program or web page in to the QuickPrint feature and print a label without opening the program. 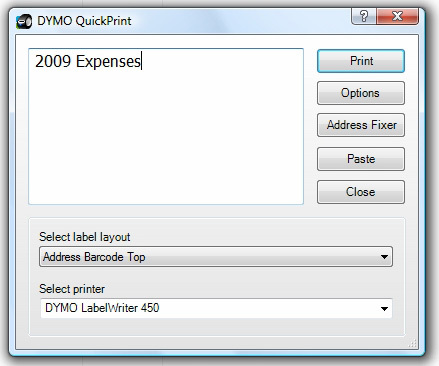 The DYMO® QuickPrint feature starts. 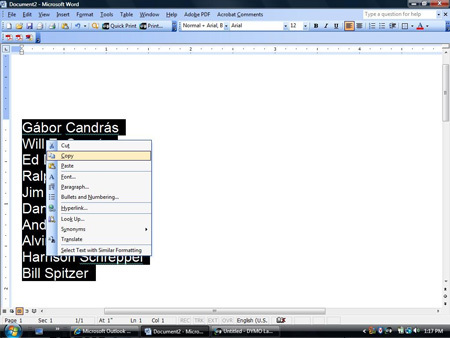 Drag, paste, or type the text you want to print on your label. Check the address with Address Fixer before printing. Choose a different label printer. 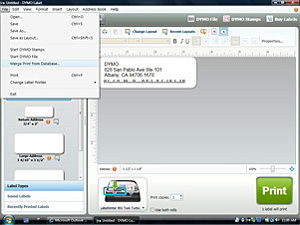 When you use Smart Paste to print labels, the labels are formatted using the current label layout. You can print using data from the clipboard or from a text or delimited file. 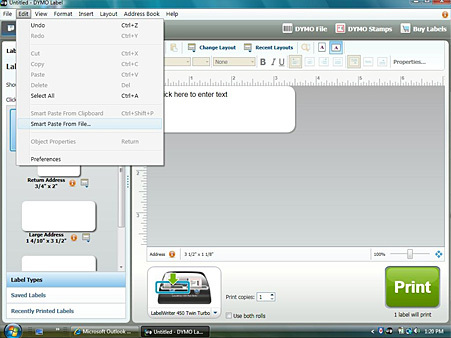 Choose Smart Paste from Clipboad from the Edit menu. A dialog box appears telling you how many labels will be printed. Click OK. The indicated number of labels are printed. Choose Smart Paste from File from the Edit menu. Navigate to and select the text or CSV file that contains the data, and then click Open. 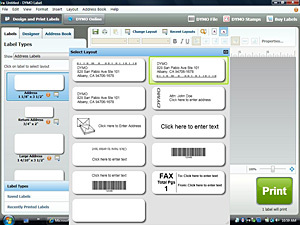 A dialog box appears showing how many labels will be printed. You can create multiple Address Books to hold addresses or other data. If you want to import addresses or data into the Address Book, you must first create the Address Book into which you want to import the information. 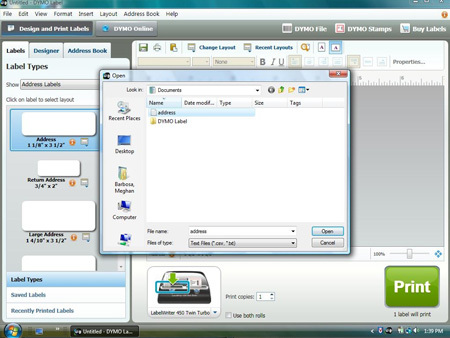 The default Address Book file installed with software is named Sample Address Book. Choose New from the Address Book menu. The New Address Book dialog box appears. Enter a name for the new Address Book in the Name box. Accept the default location to save the Address Book to, or click Browse to choose a different location. Address List - to create a new Address Book that contains address data. Data List - to create a new Address Book that contains non-address data. Click OK. A prompt appears, asking if you want to import data from an existing file. Click No to create a blank Address Book. Click Yes and then follow the instructions in the Address Book Import Wizard to import data from an existing file. 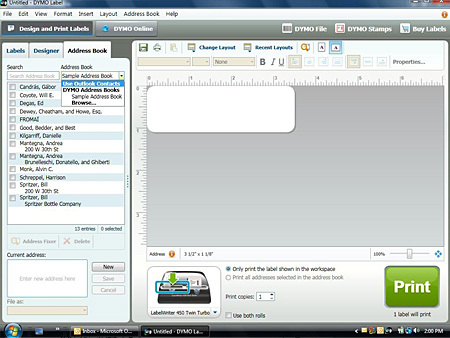 The new Address Book is saved and is displayed on the Address Book tab. A preview of each of the different label types is displayed in the Label Types section on the Labels tab. These previews help you to visually choose an appropriate label. Click next to the label type name. Locate the SKU for your label on the label packaging.